What is market shaping? And what, exactly, is “the market” anyway? Stunningly, strategy has never adequately defined one of its central institution, the market. Old playbooks got away with a hodge-podge of assertions, assumptions and approximations. But the undeniable complexity of modern markets confronts us with the truth. Markets are elaborate, evolving ecosystems – think biology, not machinery. Today, strategy must embrace complexity or die. Market shaping is the first strategy to embrace and exploit the truth about markets. It elegantly distils their complexity. And it shows how any firm can then turn strategy on its head – by adapting the market to the firm instead of the firm to the market, opening up untapped value in the process. The value market shaping unlocks defines strategy’s new “main chance”. · The strategies in the traditional playbook are built on sand. Poor views of markets have made for poor strategy. We've inherited both simplistic and mystical views of markets, riddled with contradictions and kept alive by self-reinforcing definitions behind our data. · The fact is, markets are not simply industries! Industries alone are useless – supply with no demand. And adding in a sliver of demand (the customer) for a specific product, plus maybe a place, still misses the big picture. So there are no product markets either! · The poor view impoverishes strategy from every angle. It makes strategy reactive and defeatist because markets are allegedly "given" – fixed and unfathomable – yet somehow also as simple as supply and demand graphs. It dooms firms to compete for market share in a zero-sum game, but ignores the real competition. It kills originality. And it misses the main chance: to adapt markets to the firm, not vice versa. · Drawing on biology, psychology and sociology as well as economics and management, we offer the rich reality of markets as complex systems. That's "complex" as in ecosystems and societies, rather than merely "complicated" as in machines. The complex system view tells us markets don't obey mechanical laws of cause and effect and can't be controlled or frozen in time. They constantly evolve, partly by unpredictable emergence. 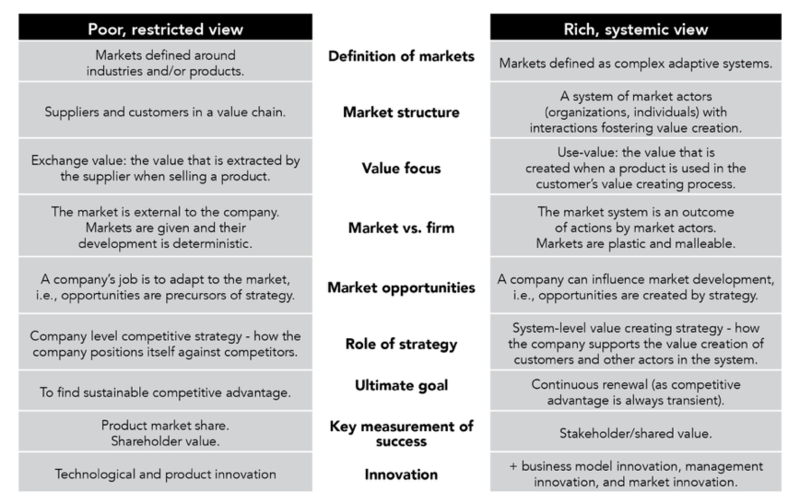 · Markets are complex systems of exchange for the purpose of co-creating value, specifically use value to the customer. And when it comes to use value, the sky's the limit. That's use value as opposed to our standard metric: exchange value – aka price. Yet growing use value can ultimately grow exchange value, markets and profits. · The complex view of markets has always been true. The poor views scraped by only while the world itself was radically less complex. Given globalization, technological revolution, network effects and disruption-as-the-new-normal, the complex view is the only map that will work in the 21st century. · Because market systems are socially constructed, you can reconstruct them, too. For, alongside random emergence, markets evolve also by deliberate design, or reconstruction. Other firms will design your market if you don't! · The pay-off for all our theorizing is design writ large: Strategies for MArket SHaping (SMASH). Making new markets and molding existing ones both count as market shaping. And in answer to other frequently asked questions: Although under 10 percent of firms currently shape markets, any firm can learn to be a market shaper; but certain market phases and environments will prove riper than others.